Anyang GEMCO energy machinery company is the enterprise who has been earlier devoted in researching and developing biomass compact forming technology. GEMCO roller-rotation tractor driven pellet machine is redesigned from the roller-rotation type pellet machine by GEMCO technology team in accordance of using requirements of overseas clients, which is suitable for pellet production in the fields powered by the tractor. This tractor driven pellet machine produces pellets 800 kg per hour. The main raw materials for this type pellet machine has a large variety, including wood, straws, cotton stem, rice husk, peanut shell, bamboo, empty branch, coal powder and waste papers etc. With stable structure, high working efficiency, high production capacity, low noise, elegant appearance, this type pellet machine is convenient to operate. The gear box runs with the high-precision gears, through connecting the connecting rod to the diesel engine of the tractor, very suitable for middle and small farms, home use, small scale animal farms, powder factory, chemical factory etc. 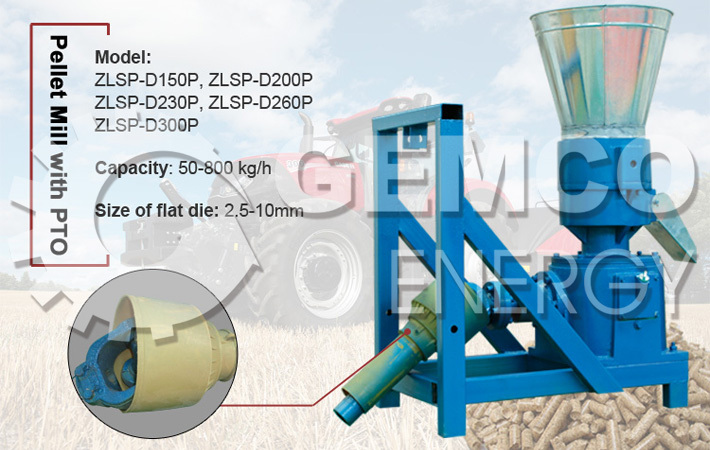 GEMCO has launched this new tractor driven type pellet machine, solving the difficulties of inconvenient power when clients use the pellet machine in field. Driven by tractor, it is easy to move, directly realizing that pellet production in the field and solving the dependence of electric pellet machine on the power. Meanwhile, the reducer structure is able to rotate in forward and backward direction, also solving the problem of short lifetime of gear in the PTO pellet machine designed with bevel gear structure. Compared with bevel-gear structure pellet machine, GEMCO roller-rotation pellet machine adopts reducer structure, with low noise, long lifetime, overall strong strength, reasonable structure, large loading power, is able to rotate in two opposite directions and high reliability etc, very suitable for continuous working, like continuous production line, industrial production etc. 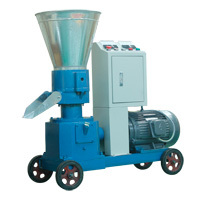 Compared with the die-rotation type pellet machine, the actively-rotating pressing roller of this tractor driven pellet machine benefits to press the materials, driving the material move, helping to mixing the materials, and the pressing roller bearing with big diameter is able to stand the counter-acting force from the materials which is not easy to form due to its high density; relatively lower forming speed reduces the sensitiveness to the raw materials, improving the adaptation to different raw materials. 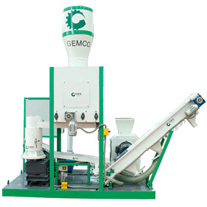 GEMCO roller-rotation pellet machine produces better pellets, which is with higher density than 1.1*10³kg/m³, good durability, bright and smooth surface, is easy to meet the storing and transportation requirements. GEMCO roller-rotation tractor driven pellet machine adopts the carbon structural steel box, whose strength extension is over two more times of the casting strength extension. Interval of rollers and ring die is adjusted in center with convenience, uniform force, larger power. Principal axis torque is two more times of the die-rotation pellet machine with the same type, more suitable for pelletizing high-hardness wood, such as, elm, bamboo etc; the length of main shaft, rollers axis, bearing is two more times of die-rotation type pellet machine, safe and reliable. If you want to get more information about price and pictures of our tractor driven pellet machine, please send e-mails to us, we will reply you as soon as possible.